Can you believe it’s almost November! It's the start of the holiday season and my favorite time of year! Between the holiday parties, school concerts, family and friend gatherings with good eats and drinks, holiday decorating, baking and gift giving/shopping these next few months are going to be jam packed and busy. But I’m ready and so excited for this time of year. November also kick starts the holiday shopping-in store and online. So if you’re a shop owner or blogger it is a great time to get your name out there as people are scouring the web for holiday inspiration and present ideas. 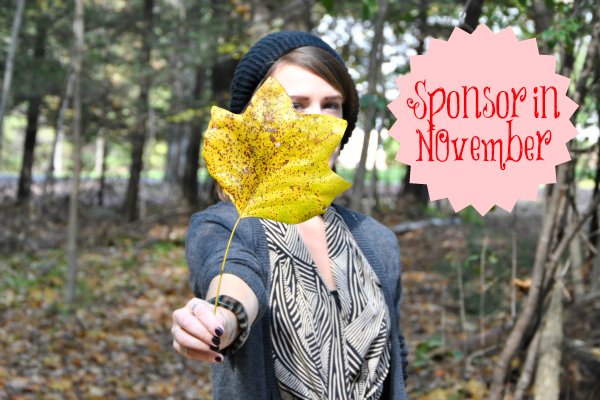 If you're interested in driving more traffic to your blog or shop, sponsorship is a great way to do so and I'm accepting sponsors for the upcoming months. I’m also putting together another Holiday Giveaway Extravaganza this year for my readers. If you have an item that you would love to be included please let me know. Also, since it is the holiday season I thought I'd offer a special deal: If you buy a 2 month ad space I'll give you 25% off the 2nd month! If you want to know more about sponsorship, options, rates, and stats please head over to my sponsorship page to get details. If you have a question or want a media kit please don't hesitate to email me!